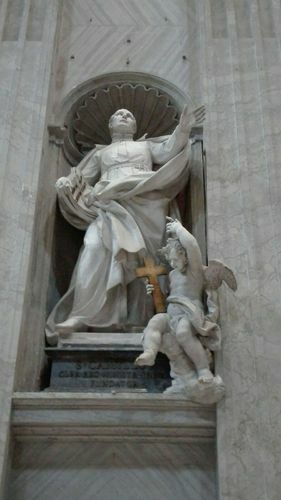 Saint Camillus de Lellis’ statue is one of the works of the sculptor Pietro Pacilli, situated in Basilica Vaticana in Rome. It was commissioned towards the end of the 1740s by the Camillian fathers to celebrate their founder and inaugurated in 1753, seven years after the canonization of the Founder of the Ministers of the Sick. Now situated on the left of the central nave of Basilica Vaticana, in 1812 the sculpture made of marble was situated in Consolazione, and after in 1933 it was transported in a livingroom in the new department of Saint Spirit’s Hospital.